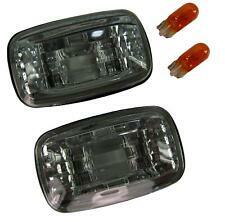 Front corner lamp KIT (Left and Right) grey colour for Toyota Celica 1989-1993 AT180/ST182/ST185. Kit de Pilotos 1/4 luz delanteros con borde color gris (Derecho e Izquierdo) para Toyota Celica 1989-1993 AT180/ST182/ST185. KIT PILOTOS CUARTO LUZ DELANTEROS (DERECHO E IZQUIERDO) PARA TOYOTA HILUX O 4RUNNER AÑOS 1988 A 1991. 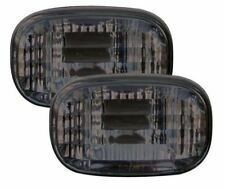 KIT CORNER LAMP FRONT (RIGHT AND LEFT) FOR TOYOTA HILUX AND 4RUNNER 1988-91 YEAR. SON TIPO "HELLA" -TUNING- (NO HOMOLOGADOS). Toyota Hilux KDN165 (Hilux 2001-2005). Toyota Hilux KDN165 (Hilux 2001 to 2005). Kit Pilotos indicadores delanteros (Derecho e Izquierdo) transparentes con fondo cromado para (SPAIN NOT APPROVED -. (NO HOMOLOGADOS EN ESPAÑA - PUEDE VARIAR SEGUN PARA QUE PAIS). ). Código interno: 398864. Piloto lateral derecho TOYOTA COROLLA 1.4 Linea Terra (3-ptas. )., Año: 1999, Observaciones: Piloto de aleta blanco. Piloto lateral izquierdo TOYOTA COROLLA verso 2.2 d-4d sol, Año: 2004. Hacemos envíos a toda España. Puedes solicitar los servicios de Desguaces Jaramillo sólo con una llamada. Sin compromiso. Nós podemos verificar isso. Piloto lateral izquierdo TOYOTA COROLLA VERSO 2.2 d-4d sol, Año: 2004. Puedes solicitar los servicios de Desguaces Jaramillo sólo con una llamada. Sin compromiso. Nós podemos verificar isso. Wir können es überprüfen. Referencia : 183575. Puedes solicitar los servicios de Desguaces Jaramillo sólo con una llamada. Sin compromiso. Nós podemos verificar isso. Wir können es überprüfen. Piloto lateral derecho TOYOTA COROLLA verso 2.2 d-4d sol, Año: 2004. Puedes solicitar los servicios de Desguaces Jaramillo sólo con una llamada. Sin compromiso. Hacemos envíos a toda España. Nós podemos verificar isso. Piloto lateral derecho TOYOTA RAV 4 Advance, Año: 2015. Referencia : 54M, Observaciones: Va en el retrovisor 2 pines. Nós podemos verificar isso. Wir können es überprüfen. Nous pouvons le vérifier. Piloto lateral derecho TOYOTA LAND CRUISER 3.0 Turbodiesel, Año: 1998. Si no encuentra la versión que necesita nos esforzaremos en conseguirla. Nós podemos verificar isso. Wir können es überprüfen. Piloto lateral derecho TOYOTA COROLLA verso 2.2 d-4d sol, Año: 2004. Código interno para información: 160597. Puedes solicitar los servicios de Desguaces Jaramillo sólo con una llamada. Sin compromiso. 1X Faldilla / Parafangos / Guardabarros para Toyota Land Cruiser HJ6# - FJ62 desde el año 1984 hasta 1990. 1x Splash Board / Skirt / Forks / Mudguards for Toyota Land Cruiser HJ6# - FJ62 from 1984 to 1990. Valid for Toyota: Hilux and 4Runner (Since year 1988 to 1991). Front Driver´s KIT (Left and Right) White Colour. TIPO TUNING (NO HOMOLOGADOS). TUNING STYLE (NOT APPROVED). GRUPPO OTTICO LATERALE BIANCO. Inserzione creata da Maxpho®. Informativa sulla Privacy. Disponibilità Prodotti. Pertanto, ci riserviamo la facoltà di modificare/adeguare le informazioni tecniche dei prodotti del catalogo, anche senza preavviso alcuno. FANALINO FRECCIA RETROVISORE DESTRO (lato passeggero). Inserzione creata da Maxpho®. Informativa sulla Privacy. Disponibilità Prodotti. Pertanto, ci riserviamo la facoltà di modificare/adeguare le informazioni tecniche dei prodotti del catalogo, anche senza preavviso alcuno. Toyota Hilux Surf 1989 - 2000. Push the side repeater to the side ( you will feel you are pushing against a spring ). Disconnect the old connector - pull out the old clear bulb abd replace with the new orange bulb then fit the new repeater - 10 minutes maximum. PILOTO TR IZ TOYOTA COROLLA 97-00. ALKAR 2205991. TOYOTA 86 SUBARU BRZ LED LIGHT BAR LIGHT SMOKED Side Repeaters. Lexus-style and styling lighting; headlights; tail light, indicators, side repeaters & more. Light Smoked LED Light Bar flashes amber. Light Smoked lens with Black surround. Toyota Hilux Mk4 / Mk5 1997 - 2005. Crystal Side Repeaters. 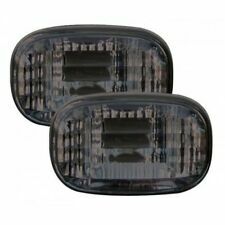 These will also fit the Hilux Surf 130 and Surf 185 models. Pull the back end forwards so it un hooks from the wing. Push the side repeater to the side ( you will feel you are pushing against a spring ). Crystal Black Side Repeaters to fit: TOYOTA Supra Mk4 (1993 to 1997) (NOT E-APPROVED). Lexus-style and styling lighting; headlights; tail light, indicators, side repeaters & more. Suitable for both Right Hand Drive and Left Hand Drive. 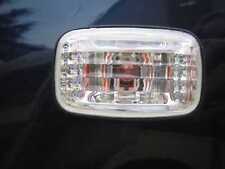 These are a great upgrade for the old style Japanese toblerone indicators, or the USA rub trim lights. Crystal black import side repeater lights for the rub strip between the front wing / fender and bumper. Crystal Side Repeaters. Toyota Hilux Surf. Push the side repeater to the side ( you will feel you are pushing against a spring ). Disconnect the old connector and fit the new repeater - 10 minutes maximum.